Is woman not a national treasure or what? I’m watching Password via my DVR and Betty White is one of the celebrity contestants. She obviously has a special connection to the show because her late husband, Allen Ludden, was the host of the original version back in 60’s and 70’s. She’s appeared on every version of the show over the years. At the age of 86, she’s still funny. 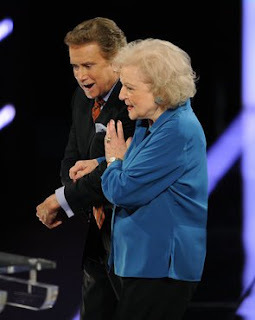 She joked with Regis Philbin that she slept with the original host of the show. She wonder what he was doing after the show. Philbin responded he’d like her review of how he did after the show wrapped. I remember her on Match Game, Pyramid and even To Tell The Truth & I’ve Got A Secret with the help of Game Show Network. Philbin called her the reigning “Queen of Game Shows”. She earned that distinction for all of her work over the years on all of the programs. I wonder how much money she’s helped contestants win over the years. You can’t forget her work on Mary Tyler Moore, Mama’s Family and of course, Golden Girls. She even most recently played a role on Boston Legal. White is also well-known for her work with animals and zoos. I’m just happy she appears to be going strong after so many decades in the entertainment business. She’s sure made me laugh many times.